AWARD-winning photographer, Allan Wright, is intent on capturing a lost army; an army, that is, of largely abandoned vintage tractors. Roaming Scotland’s stunning coastal and rural landscape, with lens at the ready, Wright takes us on an unusual journey of discovery that reflects on the role of the tractor and on how it has shaped Scotland’s agricultural history, heritage and landscape. Featuring award-winning Scottish poet, George Gunn, and retired farmer and tractor enthusiast, Ayrshireman, Russell McNab, this unique book celebrates the role of the tractor in ‘making life possible’. Visitors to Scotland, walkers, farmers, crofters and their families, plus historians and lovers of vintage machinery, will all find much to enjoy – as will thousands of tractor buffs whose enduring fascination for all things mechanical knows no bounds. Allan Wright has been a professional photographer since the 1980s. Widely-travelled across the globe, Wright is renowned for his ability to capture the variant moods and lyricism of his native Scotland’s landscape. 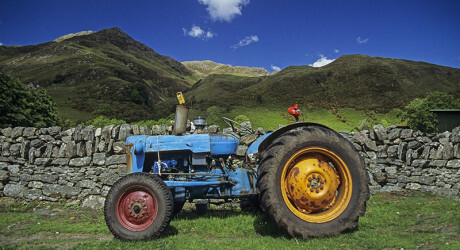 As Vintage Tractors clearly demonstrates, he relishes “zeroing in on the moment, to capture that extra-special shot”. A key feature is new work by celebrated poet George Gunn that Allan Wright specially commissioned for his book. Gunn is renowned for his ability to encompass many contrasting aspects of Scottish culture. His poetic masterpiece, which explores the tractors’ legacy, features on the book’s centre pages and is a perfect conduit to the land and to the agricultural heritage of rural Scotland. It strikes like a thunderbolt. Tractor enthusiast and long-time stalwart of the Ayrshire Tractor and Machinery Club, Russell McNab contributes his vivid personal memories of tractor ownership. His impressive knowledge and passion for tractors and his amusing anecdotes will entertain anyone who may have had or maybe still has an ancient machine working their fields or hiding in a shed, a wood – or a bog! More Kitchen Table than Coffee Table? All the featured tractors are courageously identified by McNab. Readers can have fun guessing the identity of each model before consulting the list at the back of the book! Vintage Tractors is one of two new books by Allan Wright. Introduction by The Herald’s books editor and journalist, Marianne Taylor, with her own reflections on travelling throughout Scotland’s islands. Allan’s renowned ability to evoke the unique spirit of the land and those who inhabit it – wherever he goes – is powerfully illustrated in his latest stunning publication: Scotland’s Islands.